Along with showing up precisely where he wasn't expected, General Mac was known for springing little surprises on his officer corps to keep them mentally alert perhaps--and he pulled one on Asher, who had planned to sleep in--an officer's perogative, he thought, after completing a very demanding mission in which he had lost a close friend--the closest one he had, in fact, even if he were a foreigner, a rich, little snot-nosed brat who had run away from America. Rubbing the sand and sleep from his eyes, Asher stumbled out of bed when he heard something and realized with a horrible feeling he was not alone in the dugout. His rifle? He had not kept it close enough--he was getting a little too sloppy about such things. Now in the dark he couldn't put his hands on it. Someone switched on a lantern so they could see each other. Smiling, his gold-teeth glinting, the Beduoin-robed general threw Asher his weapon. Flustered, Asher hastily saluted as best he could with his weapon in one hand, but the general chuckled. "At ease, lieutenant! This is an unofficial call. I want you to do something--something for both you and me." Before dawn, there came a loud noise as if a rock or big chunk of the lintel had fallen down at the doorway of the entrance. Startled, Heloise got into her robe, and left Harry to see what had caused the noise. A big, tall man in tee shirt and shorts was standing in the doorway, silhouetted against the pre-dawn light. She didn't recognize him momentarily, but then saw it was Asher out of uniform. "Please pardon me for this early a visit, Mrs. Turnbull, but--but I had to come--my CO just gave me my orders, that I must go to the Bible woman at once, rather than sleep in as I had planned. I have an hour and a half before I must report back to him. Could you teach me the Bible, Ma'am--the Messianic prophecies that Aloes told me about? He said you knew all about them, and I don't know about anyone else who can teach me in this camp about the Bible." Heloise nearly fell backwards. "That's a strange order from an Israeli commander to his lieutenant!" she thought. But she wasn't going to argue--he was obviously telling her the truth. Harry had come out in his robe by this time, and together they stared speechless at the early bird Israeli sabra. She repeated to Harry what Asher just said, though he had heard every word. The Israeli didn't look at all crazy, so Heloise managed a smile. "Of course! I will teach you anything you want to know. We have two Bibles, and that is all the equipment we need. But you need a notebook and pencil, which I will get for you. Can you wait outside for twenty minutes, while I get myself and my teaching materials ready?" Asher nodded, then went outside to wait, sitting on one of two stools that someone had set up there. 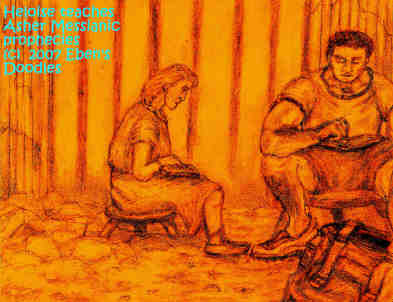 Heloise, dressed, came out with two Bibles, and Harry brought his own notebook and pen and handed it to Asher. He touched his wife's arm. "Dear, are you sure you are up to this? It may be a little too soon to--"
Heloise, her mind taken off her own great loss, was more sure of this. "Yes, I wll do it! I never turn down a serious student of the Bible, Harry! It isn't in me to do that. You know that much about me, since you wouldn't do it either!" "All right then," he mumbled. He left them to their study, and he went to explain to Myrrha, Cassia, and the other women what was happening and ask them not to disturb them. Though rusty after seven years of forced "retirement" from her ministry, Heloise knew she hadn't forgotten everything from the years of study and teaching she had put in even before her ministry caught fire and she became a big name in Pentecostal circles. It was second nature to her, and surely she could do it again, if she only went a bit slowly at first. Settled on two crude camping stools, which some tourist company had discarded at Petra, the has-been American televangelist and still grieving mother opened her Bible, and her first student--raised a secularist Jew--opened Harry's Bible. "Where do you want me to begin, Lieutenant?" she asked. "Of course, we will be starting with the Torah--which is the Old Testament to Christians. Asher thought for a moment. He couldn't quite get it settled just who his new CO, Yeshua, was--so he replied. "The Messiah Yeshua--can you show me the prophecies in the Torah and the rest of the Bible that prove he is the One we are supposed to be looking to come from God to save and deliver us?" Could she! Something like joy stirred in her broken, mother's heart, and then she thought something strange. Could this be the restart of her ministry? How else could she explain this coming of Asher, right after they had lost her son. The thought was so comforting, she almost broke and wept at the thought of the merciful kindness of the Lord for her, but she mastered her feelings and proceeded. She glanced at her watch, then began. "First we will divide up the Messianic prophecies into seven groupings. It makes the Messiah easier to understand if we use an outline. We will look at His Person, His Nature, His Appearing, His Offices, His Mission and Ministry, His Suffering and Death, and His Future. Next, let us start with His Person--if you agree to that. Any questions about this first section before we start?" Asher nodded as he quickly jotted the titles down in his notebook. He looked up. "Yes, I have a couple things. I can't understand how the Messiah could be both God and man." Heloise smiled. "It is a stupendous mystery to the human mind, is it not? But the Bible clearly teaches this is the case with Yeshua the Messiah, and so you will soon see. You can study these scriptures on your own, but take them down and we will look at as many as you have time for. If I start with several other aspects of him first, when we get to the "God-Man" part you will have a much better foundaton." "As being human, the scripture is Genesis 3:15. As descendant of Abraham, Genesis 22:18. As being from the Tribe of Judah, Genesis 49:10. As a son of David, Isaiah 11: 1-2, Jeremiah 23: 5-6, and, as living eternally, I Chronicles 17: 10b-14." Finallyt, as God-Man and Jehovah, Genesis 3:15, Isaiah 7:14, Isaiah 9: 6-7, Jeremiah 23: 5-6, Micah 5:2, Zechariah 12: 10, Zechariah 13: 7, Psalm 80: 17, and Psalm 110: 7." Asher finished his notes, then looked up with amazement. "There's an awful lot about his being God-Man, isn't here? I had no idea the prophets wrote so much about it!" His head was whirling with questions about it, but Heloise closed her Bible. "If you will first look these scriptures over, and you may take Harry's Bible until we can round up another, then come back when you can find the time and I will go over them with you. Will you do that?" When Asher had gone, Heloise stood leaning against the stone of the dooryard. She was almost collapsing--wondering what was happening. Could it be the Lord had smiled on her, and was going to use her after all? Was this coming of Asher the sign of a some new beginning? She turned to go back in and see about breakfast with the family. Then she stopped, for something shone in her mind. Who was it she was seeing? It seemed to be Asher, only a few years older in appearance. Was this how he was going to look? In the image she was seeing, he was speaking. To whom? About what?" "I have given him to you, your second spiritual son, and the first fruit of your new walk with me. Abide in My vine, and teach him well, my daughter! In My Reign, He will minister all these things you teach him from My Word to millions of My sheep across the world, all through the age that is now dawning before your eyes." She was going into the tomb to see how the preparation for breakfast was going when a butterfly flew in with her--a great blue one, with wings that were as big as a Texan, night-flying moth. As she stared at it, it circled the tomb several times then flew slowly back out the entrance. Harry came up to her. He had seen it too. Heloise looked Harry keenly in the eyes. "I think the Lord is saying something by this. We are being given a brand-new thing--a new life, just as this butterfly signifies new life and transformation." Harry said nothing. His hand, grasping hers, squeezed hers hard. "I think so too. Perhaps Aloes is still with us after all." Heloise had to sit down as she thought about it. "Am I going crazy?" she wondered. But she couldn't deny what was happening and what she was seeing. Suddenly, life had changed for her and them all. First the wonderful fragrance of aloes in the tomb! Then Asher popping up for Bible study--an Israeli soldier wanting to know the Messianic prophecies! Then the Voice of the Lord. Then the huge, electic blue butterfly! 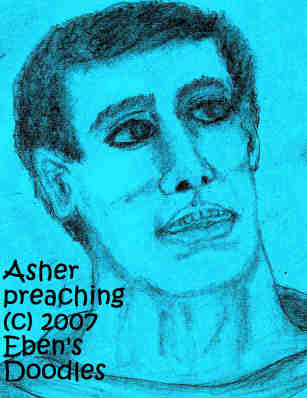 And finally the vision of Asher--a sabra and Israeli, speaking or preaching! She could scarcely take it all in. Life had been bitter and without hope just a short time ago--made doubly so by Aloes's death--but now--now--it was a new dawn, a new day. They had forgotten breakfast. "Le's go outside and get some fresh air, Harry." Hand in hand, they went out and stood, watching the sun rising--a blazing glory that turned Petra its tourist poster colors, rose-red with blue and purple in the shadows. For long moments they simply stood gazing at it, silently drinking in the stark beauty of the mountain-ringed desert city. Returned to his dugout, he found General Mac where he had left him forty five minutes before. 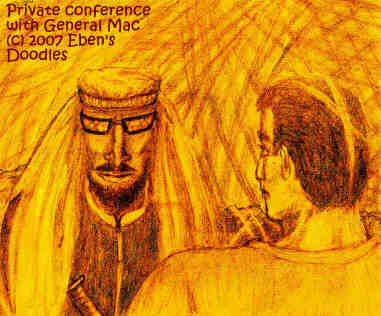 It had been the general, looking like a wild Bedouin, who had rousted him out of bed and ordered him to start learning the Bible in his spare time--which was unthinkable, of course, for any CO in the regular IDF and would have been its sequel, the GTF, except that Mac the Knife was one Messianic Jew (though not a Christian Jew) who cared nothing for separation of church and state niceties! Asher was back early, and the general was pacing up and done, muttering Arabic and Hebrew on the phone, communicating with his various units. Asher went about doing his housekeeping, trying to make it more presentable for a general's inspecting eye. Then he started work on looking up the scripture references in his notebook. Finally, just as Asher was finished with the God-Man section reading, the general turned to him. "Well, Major, how did things go in the Bible study?" The surprise showed in Asher's face, and the general laughed. Report to my headquarters in twenty minutes. We have a little ceremony planned--as best we can manage it in these, ah, sparse circumstances! I also want you to get Honorary Commando Aloes Turnbull's parents and friends to come if you can. I have something for them." Without any explanation, the general turned back to the Bible study. "The reason you are to train with the Bible woman is that she will give you an exact timetable for the events we are now experiencing and are soon about to experience. It is totally accurate. How do I know this? The ignorant world has ignored and ridiculed the Christian End-Times Eschatology of the Book of Revelation to its great harm. I shall not! I have studied and listed every battle and major victory of the IDF and found out that they had been prophesied as Jeremiah, Isaiah, and other prophets thousands of years ago! Report to me everything she tells you. But I must get ready for your promotion ceremony, Major--so your first report will have to wait a day!" The "promotion ceremony" proved to be more of an event than Asher and even the Turnbulls imagined. Except for critical sentries in the outlying passes and entry points, the GFT was present, all in as strict military formation and uniform as possible in the circumstances. It was a strange and somehow compelling sight, when General Mac, wearing his best robe that made him look like the chieftain he was, reviewed the troops, then called out Asher. As their commander pinned on his major's insignia, the GTF stood at rigid attention, then as soon as the general stood away and released the company, they all tossed their hats, and ran forward to congratulate the new major. The ceremony over, the Turnbulls, and Esther and Anna, rose to go, somewhat disappointed, because they had expected something to be said about Aloes. As they were turning toward the trail that led back up to their refuge, the general, seeing them, said something to Asher and he came running to get them. "The general invites you all to his HQ! Will you please come with me?" Heloise glanced at her husband with a tear glinting in her eye, and for a moment they hesitated, but then she thought something important was in the air, so she nodded, and he agreed that they should go--if only to show respect to Aloes' commander. Asher escorted them to the netted HQ which was an ordinary dugout like the others, but this one, of course, was the central nerve center of the GTF and heavily guarded. They had to pass through several checkpoints, and then Asher led them down into the HQ through the narrow entryway, which was a sort of chute through the rock and sand. Inside the HQ their eyes had to adjust a few moments to the change in light, but then they saw that the general was standing, waiting for them. He had tea brew in elaborate Beduoin tea pots, and he served them himself, with tiny, elaborately silver-chased tea cups where he had them sit on his finest carpets. As they passed a few pleasantries in the first awkward moments, Heloise began to wonder what was the purpose of all this. Harry Turnbull too, was as restless as she was. Anna hated sitting down on a carpet, and was beginning to curse in Yiddish, while Esther tried to shush her. General Mac put his tea pots away, then sat. He looked long at them, with no change in expression. Then he began speaking quietly, motioning to Asher to sit as well on the carpet beside him. "I have requested your presence here with me and my new major, because all you have been closest to the volunteer, Aloes Turnbull." He bowed his head toward Harry and Heloise, who had set down their tea. "I presume you are the parents?" Before they could respond, he went on. "I fully instructed your son how very dangerous this operation would be, but he was of age and committed himself to help us anyway he could. You must know that." Heloise and Harry and their daughters looked at each other, and had nothing to say. The general went on. "I wasn't sure he would agree to this mission when I gave him the details, but he accepted without hesitation. I thought he was a fool, if you will pardon my saying so, but he was not, for he said in the interview, 'If I do not do anything, it will be a coward's end for me, as the Anti-Christ is coming for us all here to slaughter us, is he not? This way I can first do him all the damage I can do--so I must do this, if you will let me join up." The general paused, then smiled. "That seemed sensible enough for me. I accepted his joining us as a foreign volunteer for whatever duty he was assigned by his mission unit officer. He was extremely pleased, it was evident to me--but there is more I wish to tell you." They waited a moment as the general seemed to gather his thoughts. "Since he knew that none of us could assure ourselves surviving the mission, he asked for no special treatment. His unit officer gave him none, and he was exposed to the same hazards on the initial phase of the attack. We all know what happened, so I will not go over the event. I am, nevetheless, grieved for you and also his comrade here beside me, and please let me know if there is anything I can do for you. We would have brought his remains back here, except that I have been informed there has been some strange incidents involving them, which you may have heard about?" Heloise spoke for the first time. It was most difficult to say, but she got it out. "Yes, we have heard them." "Very well, I need not review them then for you. I was not there myself, so I will take my major's word for it--and I know he is truthful--perhaps to a fault. But now here is the reason why we are assembled here. It was not something I needed to share with the entire force, as you will understand when you see it." The general moved quickly and silently, and he left them for a moment to go to a large, ornately carved chest, removing something. The gathering stared as the general unwrapped the object, and it was a a crystal vase, or so it appear, with a stopper of gold and silver, with jewels encrused in the filligree work. Truly, some sort of family or clan heirloom. Heloise was astonished as the general handed it to her with a bow. "It is a mere trifle, which cannot make up for your loss, I know, but it has been in my family for generations. I do hope you will take it as a token of my appreciate for your son and his sacrifice for my people's sake." Heloise grasped the crystal vase, carved from a single giant crystal. It was worth a great deal, she could tell, but the stopper was even more costly. And it was filled with something. The general saw she was examining it. "It is a rare perfume we favor in these lands," he said. "Do you know it? It comes from a certain rare tree. I believe the word you use is 'aloes'--the name you gave you son, by the way." Heloise could not believe what she was holding. But how could the general have this particular perfume in his possession? The general's face grew very serious, while it had always been unsmiling from the start of the meeting. "It was one of the few things I saved from my family's home, when it was bombed and everyone but me killed when the Palestinians' missile from Gaza struck. Put in a storage place under the floor, it was intact, so I took it with me, and did not know what to do with it until now. It is yours!" "I cannot accept your family's treasure, sir!" Heloise protested, but Asher's eyes showed alarm, and she checked herself. "But then, for Aloes' memory, I will! We thank you very much!" The general seemed pleased, and he rose to bring them more tea. As they sat drinking their second cup of tea, while Anna began to snore loudly where she had lain down on her carpet, the general seemed in no hurry for them to go. But Heloise realized that they were perhaps taking more time than they should. She tugged at Harry, and he too thought the same thing, and they set down their cups and glanced at Asher, who was not drinking anything. Asher rose. The general too then rose, and the Turnbulls realized it was time for them to go without showing disrespect. The general bowed to them a final time, then Asher led them back out of the HQ, but once outside he turned to Heloise and Harry. He glanced at Heloise, who was carrying the aloes perfume vase. "I now tell you the truth. That is the scent I smelled at the rescue site in Jerusalem! It is the same! And it is the same scent that has followed us here, even to your quarters! What could this all mean?" Heloise stared at him, then tried to explain something to the sabra. "I have some information on this I will tell you later. It was something the Lord told me about our family, on the nature of how he would use us in the future, and now it is coming to pass!" Asher was satisfied with that much for now, and he led them homeward. When he had gone, promising to come to Bible study in the morning, the Turnbulls settled down with Esther and Anna for the night, no one referring to the odd events they had just witnessed in the general's headquarters. It was all too strange to know what to say about it. In the morning, Asher was good at his word, and a puffy-eyed Heloise pulled on her Israeli flight jacket over her gown, and went to sit on her stool and start the study. The next morning, Asher was back, and he had reported what he had learned to the general. This time he had the general's remarks to deliver. "Our commander said to tell you, for your ear's alone, that we are going to rescue another group of detainees, this time in Argentina, at a site on a base outside Buenos Aires. Jewish people are being shipped to the main detention center for 'processing'--which we know is the same they use for making fine toiletry hotel soap! We must prevent this. Will you help us? The general wants to know." "How? I am not a military person. What can I possibly do? I'm at a loss to know what the general is thinking about." Asher related the general's remarks. "He said to share these details with you, so you can know enough to help us. We can do it logistically, but there is this major problem with the mission. There is no food we can bring, and they will starve in the temporary safe place where we plan to put them before we fly them here via the Saharan route. It is not possible to supply them food, though there is water on the site. They will have nothing for three weeks, the time they will have to wait there for us to finish the link-ups for their transport to Petra. The general said we cannot starve women and children and old people--many will die in their already weakened condition. So the mission is stopped, unless you can give us a word that will help us. The general is certain you can help us--and if not--they will perish!" Heloise was listening to all this, with a growing impatience in her face. "What foolish talk is this! Can he find nothing to trust in God--that the God of Abraham, Isaac, and Jacob will surely provide for His children? Asher looked at her, unable to disagree. "Well, perhaps he does not yet know Him as you do, Mrs. Turnbull. He believes in the Torah, the Bible, but knows only what I tell him, other than the military applications to certain prophecies that he studied in his youth at a military academy. Perhaps, you can assure him in this respect that God is faithful to his promises." Heloise rose. "Go tell the general not to fret. It is ungodly to fret. Just believe! Tell him that. And have him read Psalm 78: 19-29!" Asher hurried away with his next assignment and also his teacher's special instructions for General Mac. He wasn't sure the general would appreciate having to read the Psalm, or whether it would be any help to him. All he could do was serve as the messenger, and see what happened. 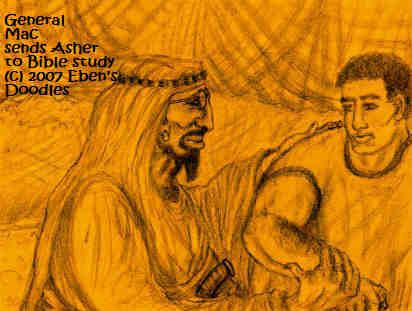 The next morning the general appeared in Asher's dugout, and Asher leaped out of bed and grabbed his Bible. "Sir, I have your answer--I hope anyway! The Bible woman said for you to read Psalm 78: 19-29." He had already marked them for the general. General Mac snorted. "You read them, Major! My eyes aren't so good, and I don't have my reading glasses!" Getting a lantern out and lighting it, Asher then turned to the portion of scripture and began reading. "Therefore the Lord heard this and was furious; so a fire was kindled against Jacob, and anger also came up against Israel. Because they did not believe in God and did not trust in His salvation. Yet he had commanded the clouds above and opened the doors of heaven. He had rained down manna on them to eat, and given them of the bread of heaven. Men ate angels' food; He sent them food to the full--"
The general, meanwhile, had removed his sun-blocking, reflective glasses, and Asher caught a glint of anger that alerted him, and he paused. "Stop! What is this impudent Bible woman charging me with! How dare she! Well, Major--read on!" Not sure the remainder would make the general any happier, he continued somewhat haltingly. He cleared his throat loudly, then resumed reading. "He caused an east wind to blow in the heavens, and by His power He brought in the south wind. He also rained meat on them like the dust, feathered fowl like the sand of the seas. And He let them fall in the midst of their camp, all around their dwellings. So they ate and were well filled, for He gave them their own desire." Finished, Asher looked up, not daring to add anything. The general exploded, after pacing back and forth a couple times. His arms moved like pistons, as he gestured while delivering rapid-fire Arabic that Asher could not follow, except that he caught a few words that were similar in Hebrew. There was one phrase that kept recurring, something to the effect of "donkey's head pushed up a donkey's behind"--which Asher thought might owe to the ancient, pastoral tradition of the Beduoins more than the settled, urbanized Jewish people. As the general calmed some, he seemed to notice Asher was still waiting for his next instructions, and he suddenly fell silent, his bright, furious eyes working back and forth over the ground. General Mac walked right up to Asher, taking his tee shirt by the neck, almost pulling it off the startled Major. "Ah, so she thinks tasty, little birds will fall into their camp and feed them! How nice of them! That is what I am to believe? I never heard anything more preposterous. God will send a flock of birds and feed all those people. That will take a lot of birds! Does the Lord God have so many available? Eh? Eh? Answer me!" Embarrassed, Asher could only nod and back off, hoping he could save his tee shirt from being ripped. His befuddled response must have struck the general as amusing, for his anger flew away and he was chuckling to himself. Finally, he went and paced back and forth, then turned to Asher. "Major, I have considered her, ah, advice, and I will believe God for His provision from heaven, via the winds, as she has said I must believe. But if she is wrong--it is going to cost us all dearly, including her! We will all land in hell! All those lives will be lost, including perhaps ours--and then what will the survivors here do? We must not fail! This must be done right--or not at all! We cannot afford a failure! Are you sure, Major, she is not crazy--maybe a little bit?" The general eyed him keenly, from a mere inches away, but Asher did not waver. "Yes, sir, she is reliable, and the Word of God is to be trusted on this matter, if she says we must trust it. God did it for others, in early times, can He be any different today and not fulfill his promises?" The general glanced at him a final time, then in a moment was gone, leaving Asher to think about his astonishing statement. Did he really trust God as this Bible woman did, and did he really trust the Word of God, as he had just advised the general? He was not so sure now. If he had been wrong, and the general did as he was advised and it all turned into a disaster--what then? They would be all ruined, or dead...it was terrible to think about. With his knees giving way, Asher sat back down on the bed. It took some minutes before he felt he could get up. What had he done? He had surely overstepped himself this time! He felt like an utter fool! He decided he had to go and tell the general immediately that he had thought it over and reconsidered. He ran and reached the general's HQ just as he was leaving it. The general had his top aides, and the major saluted them all. The general, looking annoyed, paused. "Well, Major? What is is?" "General, I think I must tell you--"
He faltered, unable to get the words together. The general shot a glint of anger--which, for anyone who knew him, was a clear warning sign not to proceed hastily. "My decision is final. The mission is on! We will trust this Bible woman's verses are from God. Have anything to say about it? Be careful what you say." Asher gulped. "Excellent! I will await my orders, sir!" "Is that all you came to say--well, await them then!" The general giving him the look he reserved for utter fools or donkeys shot away, his staff running to keep up as he headed for the chopper that was already landing fifty yards away. The next morning, at 0100, the special mission squadron left Petra. Days later, arriving at the base outside B.A., they liberated the captive Jews successfully, and then flew them to the site in Patagonia, a treeless wilderness of mostly scrubby vegetation and dry clay hardpan. Yet there was a river, running that time of year from the eastern mountain range. They had water--but nothing else, unless they could catch or shoot any of the strange local fauna, creatures that burrowed like rabbits but looked like pouched rodents. No one knew what they were--and besides these animals, there were only long-tailed rats, gerbils. They would starve there, obviously, if food was not brought in immediately. The people were, understandably, amazed when Asher and the other officers explained to them that they had no food for them--but would have to wait for some to arrive. "When?" "What kind of food?" "Explain what we are to expect!" Asher couldn't tell them. He was truth, however, to a fault. He told them the answere to their questions was in the Psalms. He had his Bible, and they demanded he read it to them. When he was finished, the whole camp was furious, and looked as if they might pick up stones and stone him and his men right there, for landing them in a spot where there was absolutely nothing to eat. "But if you will only trust the God of Abraham, Isaac, and--" was as far as he got with them. He was pulled away by his own men before they were stoned. Running to their choppers, they took off, tears in their eyes. What else could they do? It was now up to God, Asher thought, to come up with the food, to back up his promises, even if these particular people did not believe any of it! Would the Lord God have mercy on them despite their unbelief? Would he fulfill his scriptures again, for their sake? Would they live, or would they perish? In several weeks time, the GTF would be back to find out. It was an awful thought--what if all they found were dead people, or cannibals picking the bones of the dead? Asher rushed to General Mac's dugout, the moment he got wind that he was back in the camp. The guards at the perimeter did not let him pass as usual. He was made to wait, and then, after a lengthly wait, he was allowed to proceed. By this time, the sabra was really steaming. General Mac wasn't facing him, for he was busy with some items, which Asher couldn't tell were his elaborate Beduoin tea utensils or maybe even a portable assembly kit for plastic explosives that was his latest project. Without any sign he knew Asher was standing at attention, waiting for the general's attention, the general made a slight gesture--darting a quick glance in his major's direction that gave Asher his signal to come out with whatever was bothering him. And Asher needed no more permission than that. "Sir! Is it true? 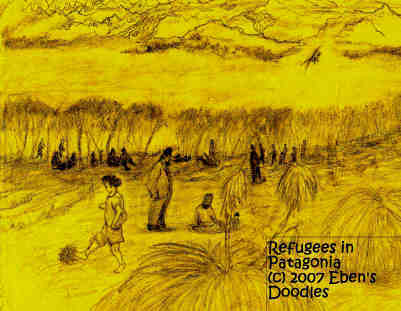 Did you send the Bible woman to the refugee pickup site in Patagonia"
The commander's shoulders seemed to relax a bit, but he still faced away. "So what if I did? Should I have consulted you first, Major?" Asher was now beside himself. He hardly knew how to respond. "But sir, what good could she possibly do there? She'd just be in the way, one more body to rescue--right? We might not be able to get back there, and--and--"
The general spun around, some of his scraggly beard gone, showing that he had been trimming his beard and moustasche a bit. "And she'd starve with the others, Major?" Shocked that his commander had read his thoughts, Asher was silent, then recovered himself. "Well, sir, it wouldn't do any good, would it? One more, that's all." The general dropped his scizzors, mirror, and razor, and stood and faced toward the west. He wasn't even seeing the netting, it seemed, or the dirt mounds, or the chunks of Roman statuary. "Yes, Major, I've thought it over. You know what happens--or used to happen--to false prophets in our religion--they get stoned to death, if they aren't telling the true mind of God, and good riddance to them! But this one--she's different--she will be okay. Besides, they needed some medical attention by this time, and she has some training. So I sent her and some medical supplies--and she had no choice, being under martial law, you know." Asher went back to his dugout, not wanting to go up to the Turnbulls until he knew Mrs. Turnbull was all right. How could the general be so sure about her? he wondered. What if she hadn't got her scriptures correct? She would be stoned! What a terrible end for Aloes's mother! If only he had heard about the general's little plan to ship her off like this! Maybe he could have done something to hide her from General Mac? But he knew that wasn't too likely--the general seemed to anticipate everything. That was, after all, how the general had survived, and everyone hanging to his robe, until now! With a huge sigh, Asher fell down on his cot, which then crashed beneath him, spilling him onto the ground. He pounded the ground with his fists. How could the general be so sure she would be okay? He didn't believe him anyway. That was just talk to put him off. It was just like General Mac to send her there, not to practice first aid, but to see if she and her prophecies were true--and pay the full penalty, if they were not! You didn't make a fool of General Mac twice--not at the price of Jewish lives! Everyone knew that much about General Mac! Days later, Asher got word first sent in to General Mac that Mrs. Turnbull had arrived safely in Argentina. As soon as he heard it, he ran up to tell Harry Turnbull and his family. The general had passed a few details to him. Not surprisingly, it had been one adventure and narrow escape after another getting her there. Crash landings, one chopper shot down in the Congo on some crocodile-infested river bank, hiding in the jungle until another chopper was able to find and pick her and the pilot up--a submarine taking them the rest of the way to Argentina--then a final ride by chopper to the refugee haven. Asher and the Turnbulls waited on tenterhooks for the next news, and prayed unceasingly. Would God send food in a miraculous way to keep the refugees in Argentina from starving until help could arrive? They couldn't transport the entire group without at least ten aircraft, and how could they elude GPS and satellite spies with that large an operation. Taking a few out at a time seemed more logical, but that wasn't an option either, as if anything happened, that group was lost--with no one within thousands of miles able to rescue them. No, they all had to go at one time--or not at all. That meant quite a wait. General Mac was the only man who could assemble, clandestinely, the helicopters, the fuel depots, and the contacts needed all along the route, to pull it off. A mastermind, even this was taxing him to the maximum, and he wasn't going to be hasty, this had to be done perfectly, or there would be a total disaster on his hands. Characteristically, the only sign that he was under extreme pressure was that he spent more time playing chess with his officers and whoever filled in from the lower rankis. He played chess night and day--it was his lone passion--other than leading his men and saving fellow Jews from extermination. During this hiatus, good news arrived at Petra--the children were doing well, and there were arrangements being made for reunions, but only a portion at one time, as there was to be no risking of the entire group at any single time. It happened that Esther and the Grandmother were reunited with Esther's daughters. The joy of that family, together with the Turnbulls', was almost crazy. But it could only last a couple days, as the children had to be returned to their safe haven, a place somewhere in Moab's mountains, on Jordan's side, that was even safer than Petra. Meanwhile, bits of news filtered down to to Petra of the Anti-Christ's operations against the combined Asian offensive. It was not very encouraging, as it seemed he was going to fight with his entire nuclear arsenal, in an attempt to push them back all the way to Beijing. With so many nuclear weapons used, what would be left of the Middle East? Of course, the Anti-Christ couldn't care, as long as his forces still controlled the vital oil sites in the region--and he would still have Europe and Africa and other satrapies--empire enough to strut around in the rest of his days! The Middle East, including Israel, was expendable, in other words, and only the oil mattered to the big man in Rome. 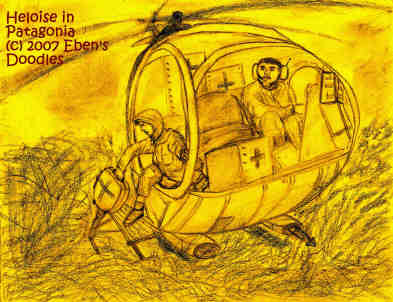 While things were heating up between the Anti-Christ and the Asians, Heloise was put to good use by General Mac, as she flew with Chaim her pilot and an assortment of basic but critical medical supplies to the refugee camp, which was meant to be temporary, of course, but as yet there were not helicopters enough to rescue them. As the chopper barely cleared the peaks in the so-called "mountain pass" in the southern Andes, Heloise had all she could do to keep her stomach contents as they clawed their way slowly up one monster ice crag and the next that stood towering and blocking their path. Finally, they were out of the incredibly-jumbled death-trap of jagged-toothed crags! The worst was behind them, or so it seemed, as they dropped swiftly down thousands of feet toward the Patagonian plains in southern Argentina. Virtually uninhabited, for the most part treeless, Patagonia's wilderness produced mostly grass, and spiky agave and yucca plants of various kinds, but the grass, which stood up in massive clumps like pampas grass, was deceptive--it was so thick and high it could easily conceal horses! At one time the region, which was as large as France, England, and Belgium combined, could boast a hi-tech-equipped hacienda and rancho owned by Jane Fonda and Ted Turner--but "Rancho Paradiso" had been abandoned, and burned down, leaving nothing but snake-infested ruins that the grass quickly invaded. This never inhabited wilderness site, however, was ideal for a refugee--so isolated, there were no access roads anywhere within four hundred miles, and the horse-high grass could hide most anything from the air. Now that they were almost there, Heloise's fears rose up. What would she find there? Would they all be dead or dying from starvation? How had they gone weeks without food being flown in? And what about water? Was it potable? Or had they all gotten dysentery or typhoid or malaria or some terrible southern water-borne parasite? And what about snakes, venomous scorptions, and such? All she could do was hope her stock of serums would cover the wide range of things she knew could be attacking the refugees in such a savage place. Chaim flew toward the site of the camp that had been set up along a dry river bed where some scrappy little trees afforded some shade and also concealment. Buildings would have been spotted by GPS satellites, of course, so it was vital that nothing be built or changed--unless grass were used. He also told her their window of time was very limited. The GPS staff at at the North and South American surveillance center that had responsibility for this area of continent was known to take a lunch break lasting about an hour, leaving the monitors unmanned, so they had no time to waste. Once spotted and the alarm went out to the military, they would have only an hour more to make a getaway on their second tank of fuel. After the fuel reserves dropped perilously close to the red on the "to" tank, at last they came in sight of the camp. Heloise could see nothing at first, but only when they were almost directly over the camp was she able to make out the people, they were so well covered by the little trees and the forest of grass. They circled, dropped a blue and white Israeli flag to tell the refugees they had nothing to fear, and then moved well enough away toward some bare ground where the grass would not catch in the whirling blades. Faint with all she had undergone in the flight from Chile, Heloise jumped out, she was so anxious to touch terra firma again. As she started struggling through the tall grass to get to the camp in the distance, the pilot stayed, to wield his machete and heap up grass over the cabin, so that no glint of glass or metal could be visible from the sky. Even if a camera zoomed in on it, it would still be virtually undetectable. By the time it was identified, he would be gone anyway, well on his way to the mountains. 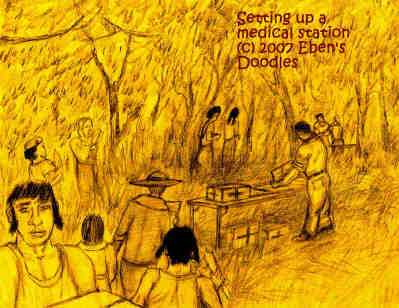 Only when he had covered the cabin did he then get a box of medical supplies and follow Heloise to the camp, catching up to her easily because she had gotten lost in the grass and was wandering confusedly in a circle. After they made it to the camp according to the coordinates they had been given, it was time to enlist help. Nobody looked starving to death to her, but there was no time to ask where they had found found in such a wilderness. The rest of the supplies needed to be brought from the chopper, and a medical station set up. They had no time to waste either. As Abramov, her pilot, explained what was needed, Heloise began passing out the questionnaires that would speed the process of diagnosis and treatment. She knew what to do, having observed her medical teams in Haiti set up and treat hundreds of Haitians in the most primitive conditions imaginable--no clean water, no electric, no buildings, and no paved roads in or out of the area. Heloise next sought out any women who could work alongside her, helping in any way they could. She then went to choose the best spot under the trees for the station. By this time the men and boys were returning from the chopper, carrying the folding tables and the boxed meds. It was time to unpack and organize the contents on the various tables, and then set up treatment areas for various maladies. But first she had to get the questionnaires back, to see what categories she needed to treat. Serious things, such as surgeries, would have to wait, and the worst illnesses too--but the rest was within her scope, and she quickly scanned the questionnaires as soon as they began coming back to her. As she treated the worst cases she was qualified to deal with, she examined them for signs of malnutrition and rapid weight loss, but there were none that she could detect. She wasn't taking that was her definitive answer, however. "Well, how is your appetite these days?" she asked one older woman who was said to speak English, according to the questionnaire, sounding as casual as she could, so as not to prejudice the result. "Excellente," the woman replied. Her dark eyebrows arched, and she continued, "But why you ask of me, Senora? Do you think we have nothing to eat, si?" Heloise smiled, deciding to level with her, since the time was so limited. "Because I know perfectly well there is no food here, Senora, and you couldn't possibly do any hunting at your age, could you? Naturally, I wondered how you were getting on. I'd hate to think you people here are starving." The woman laughed and buttoned her blouse. "I think they bring too much good food! No husband would want me, I am getting too fat! She patted her stomach, and Heloise could see there was no danger of shrinkage there. The woman stepped out of line as Heloise waved to the next in line to come forward. By the end of the three lines, Heloise was exhausted. She had done her inspections, diagnoses, and treatments in record time, with her Chaim helping as she called for this or that item in her medical kit. It was high time to return to the chopper and run for it, his concerned glances told her, as the second hour ticked away. Then he came running back. "We've got to leave now! They're almost here! Our chopper will give this camp away, and they'll all be killed, and we with them!" Heloise was aghast, but a woman she had treated earlier, the one with the bulging midriff, shook her head, waving her arms. "The food man is coming! Never bother! It's only the food man! He come always at this time." Chaim and Heloise exchanged glances. Could they believe her? they were wondering. But it was now too late anyway. They were trapped. The incoming chopper was descending, and they couldn't possibly run and make it to their aircraft in time to lift up before they were shot down. As they waited, their hearts sinking in despair, all all-white chopper descended into view. Immediately, a makeshift dinner bell sounded, and people everywhere came out of hiding and began moving toward the landing aircraft. Thinking they were crazy, Heloise and Chaim watched, and the chopper landed and nothing worse happened. Absolutely amazed, her knees nearly giving out, Heloise followed Chaim as they made their way through the head-tall grass to the chopper. "Who is this?" Heloise screamed to Chaim above the nose of the rotary blades as they slowed and the wind blew in their faces. "He's none of ours!" Chaim yelled back in her face. "But he's got the Star of David!" Before the rotary blades had stopped, they ran ducking their heads to the aircraft, and then the door opened and a very tall fellow in all white flying gear stepped out, carrying a box. He saw them, and smiled. "White Angel Commissariat, at your service!" the man said. "Would you like to see a menu?" As soon as the chopper was unloaded and the meals already being enjoyed, Heloise and Chaim were anxious to leave, but the White Angel cautioned them not to leave. "There are great changes in the earth coming in a few moments. You must remain on the ground. Then I will show you what you have to do." 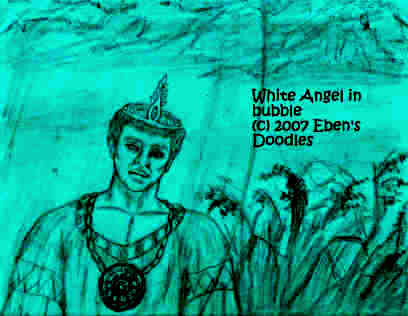 The Whie Angel then left the white helicopter, which vanished and was replaced by a shimmering bubble. He stepped into it, facing them. Even as this happened, the light suddenly darkened to a kind of twilight all over the world. A cold wind blew down on them. The ground began to shift beneath their feet, srinking and contracting, moving noticeably northward. People began crying out in alarm, but the White Angel remained smiling at them, unperturbed.